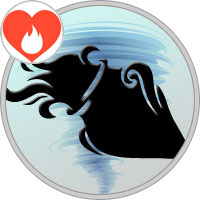 Born under the Star Sign of Aquarius, you’re the most shocking flirt in the Zodiac! If you’re typical of your Sun Sign, flirting for you is about creating an irresistible sense of surprise and excitement that stuns the other person into submission. So what’s your magic formula? Well, simply to let it all hang out and just be yourself (okay, perhaps with a touch of dramatic embellishment!). Because no-one better understands the power of attraction of the unusual, you’re happy to draw on all your little quirks and idiosyncrasies in order to lure your prey. By coming across as a bit controversial, a bit rebellious, maybe a little bit off-the-wall, you aim to blow their mind. Before they know it, you clever old thing, you’ve convinced them they’ve never met anyone so amazing before - and they’re well and truly hooked! Your flirting style shows off your unique individuality. Your charisma is electrifying –after all, Uranus, the planet of electricity, is your ruler. You flirt especially well in groups, entertaining several interested parties at once with your wit. Being an intellectual air sign, you want an intimate brain-to-brain connection with your cohort. And if some otherworldliness emerges too – all the better! You love to flirt because it shows how charismatic you are. You don’t need to be one-on-one to flirt; you can flirt with an entire group with your brilliance, wicked sense of humor, and passion. You like to surprise people and keep them off-guard with your flirting. If you’re feeling like having a casual encounter, then find yourself a Scorpio, Pisces or Leo. If you find yourself ready for a long-term commitment, then a Gemini, Libra or Sagittarius is best. Not necessarily the easiest challenge for you, but at least you’re on home ground! No danger here of either of you being out-smarted or out-shocked. You’re equally matched in terms of inventive genius, you’re both pretty much unshockable - and you’ll certainly be wise to all each other’s moves! The problem, though, is that since you’re both such bright cookies, there’s inevitably going to be some competitiveness going on. The chances are you’ll each be being trying to prove that you’re the coolest and the most outrageous - and what starts off as a little harmless flirtatious sparring could quickly get out of hand. Your worst tactic, then, with another Aquarian is to get into a silly ego contest and both end up losing out. Your best tactic is to create a strong sense of connection by proving how much you are alike. Attract their interest by pointing out any similarities you’ve noticed between the two of you, focusing particularly on the political, social or humanitarian causes that are closest to your heart (most Aquarians are big reformists).